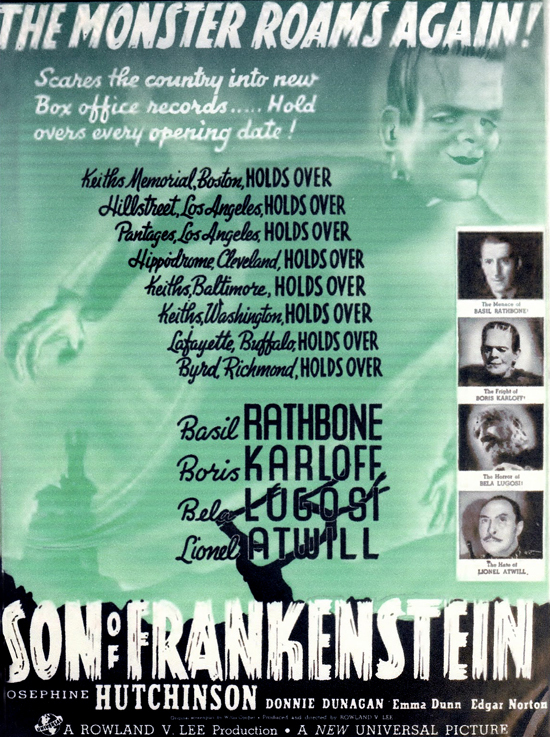 The Monster swoops like a greenish ghost out of a foreboding castle and flies over a desolate landscape in an unusual trade magazine ad for Son of Frankenstein (1939). Most curious of all is The Monster’s smile. Was the studio downplaying the horror aspect, or is The Monster happy with his success as he “Scares the country into Box office records…”? Produced and directed by Rowland V. Lee, Son of Frankenstein was put into production soon after a revival double-bill of the 1931 classics, Dracula and Frankenstein, did exceptional business. 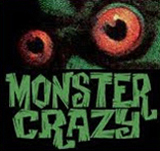 The film signaled the beginning of a new wave of Universal horrors that would return Frankenstein, Dracula and The Mummy to the screen along with a new player, the Wolf Man, culminating in the multiple-monster rallies of the mid-Forties and a momentous 1948 meeting with Abbott and Costello. 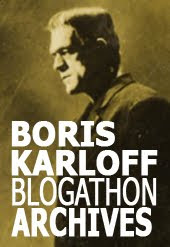 Son of Frankenstein starred Boris Karloff in his third and last appearance as The Monster and introduced Bela Lugosi as the scruffy, scene-stealing Igor. The film also features Basil Rathbone, who would make his first Sherlock Holmes film the same year, and Lionel Atwill as the wooden-armed Inspector Krogh. Son would go on to be the main inspiration for Gene Wilder and Mel Brooks’ Young Frankenstein (1974). The latter. Not unexpected, in a Ballyhoo piece. I've not seen this one before, excellent stuff Pierre. I like the use of the word "Roams" instead of the usual "Marauds"